Salesforce.com Inc. has promoted its chief operating officer (COO) to co-CEO. On Tuesday, the San Francisco-based CRM giant announced that effective immediately Keith Block, who had served as Salesforce’s vice chair, president, and a director since joining the company in June 2013, and as COO since February 2016, was being promoted to co-CEO. While the announcement could be seen as laying the foundations of a succession plan, present CEO, chair, and Salesforce founder Marc Benioff indicated that wasn’t the case to Fortune, telling the publication that “running the fastest-growing software company in the world is more than a full-time job” and that two people were needed to do it. 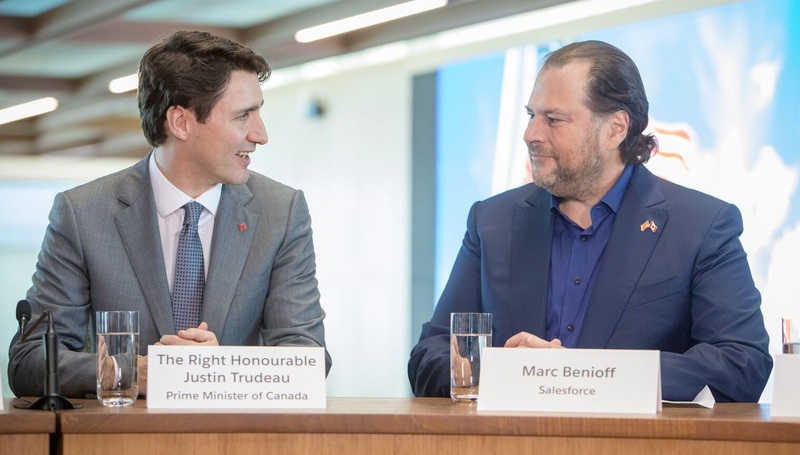 Salesforce founder and co-CEO Marc Benioff (right) with Prime Minister Justin Trudeau in February. As co-CEOs, Benioff and Block’s roles will be clearly delineated: Benioff, who will continue to serve as chair of Salesforce, will be in charge of “vision and innovation” in key areas such as technology, marketing, stakeholder engagement, and culture, while Block run day-to-day operations and be in charge of developing and executing the company’s growth strategy. “Keith has outstanding operational expertise and corporate leadership experience, and I could not be happier for his promotion and this next level of our partnership,” Benioff said according to the statement. As Fortune notes, Salesforce isn’t the only company to implement a dual-CEO system, though according to the publisher only 23 of the Fortune 500 have done so. A notable example in the tech world is Oracle, led by Safra Catz and Mark Hurd, with founder Larry Ellison as CTO.